Why Is The Number 8 Considered Lucky In China? For Chinese the number 8 is considered lucky just like the number 7 is considered lucky in the West. Therefore, it should come as no surprise that the Olympic games in China start on August 8, 2008 or 08/08/08. In China you have to pay extra to have the number 8 in your phone number or license plate. In addition, home and business owners like to have the number 8 in their address. So, why is the number 8 considered lucky in the minds of Chinese people. The main reason has to do with the pronunciation of the word for the number 8 in China. It is pronounced "ba" and sounds like the word for prosperity which is pronounced "fa". 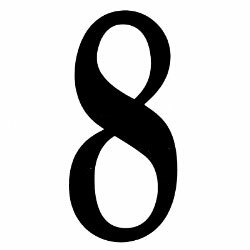 Another reason why the number 8 could be considered lucky is because it is a perfect symmetrical shape. You can cut the number 8 in half vertically or horizontally, and both halves mirror themselves perfectly. Perfect symmetry lends itself to perfect balance. In Chinese Astrology, perfect balance is considered the ideal. On the date 08/08/08 there is predicted to be a record number of weddings, even surpassing the number of weddings on 07/07/07. According to Chinese Astrology, the date 08/08/08 is in the year of the Rat, the month of the Monkey and the day of the Dragon. It just so happens that the Rat, Monkey and Dragon are in the same affinity group or trine. That means the three Chinese Zodiac animal signs are perfectly compatible with each other. Therefore, the date 08/08/08 will be especially lucky for Rats, Monkeys and Dragons.